Beat eggs and milk with wire whisk in medium bowl. Melt Country Crock® Spread in large nonstick skillet over medium heat. 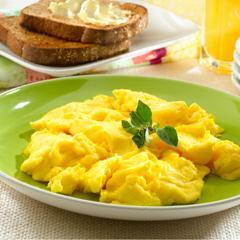 Add egg mixture and cook over low heat, stirring frequently, until eggs are thoroughly cooked, about 2 minutes.